It’s possible to achieve incredible fitness results working alone. With long term consistency, drive, and motivation, you can reach your goals and create massive changes in your body. But, sometimes, it helps to have support, guidance, and a little bit of encouragement when the going gets tough. Changing your lifestyle habits is really, really hard, and having someone “in your corner” can make all the difference in the world. In fact, many of our members here at Fit Factory say that they wouldn’t have succeeded (or even continued to show up) without the accountability from their personal trainers. So, if you’re struggling to stay committed, sick of not seeing results, and ready to make a real-deal change, today’s post is for you. 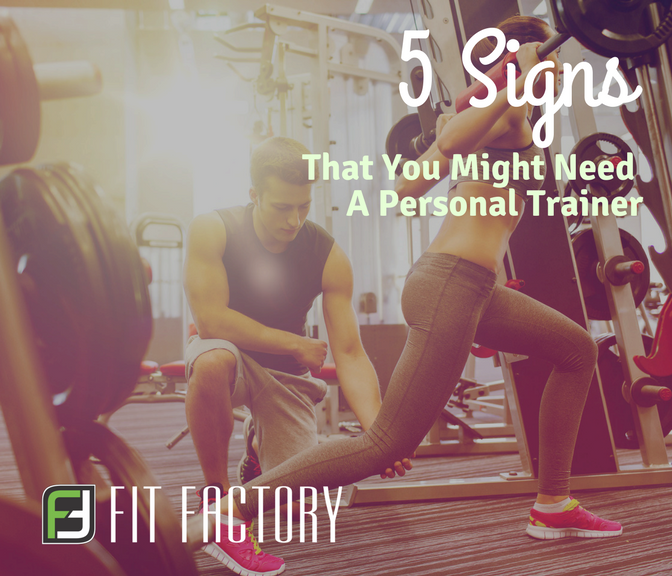 Here are five signs that you might need a personal trainer. Different types of exercise will lead to different types of results. Pretty simple, right? But sometimes it’s tricky to determine what style of workout is right for you. Maybe you’re trying to lose the baby weight. Maybe you want shredded abs. Maybe you want to slim down without bulking up. Maybe you want to increase overall strength. Those are all awesome goals, but they require different workouts, diets, and timelines to complete. If you team up with a personal trainer, they can give you knowledgeable advice, personalized recommendations, and a customized plan to get you on the right track towards your goal. We’ve all skipped workouts before. Sometimes it’s because of illness or a family emergency...other times it’s because we stayed up too late watching Netflix. It’s normal to miss a scheduled workout every once in a while, but if you’ve developed a habit of skipping workouts once (or twice...or three times…) every week, it might be time to bring some extra accountability into your life. Sometimes, your life circumstances make it difficult to find the time or energy to make it into the gym regularly. You’re dealing with a busy season at work or you have a demanding family life, and you just don’t have a whole lot of willpower left over! And that’s okay. But if you still want to stay committed to your fitness goals, despite the busyness in your life, a personal trainer can make that happen. They’ll provide the extra support and accountability that you need so that you’ll never have an excuse to skip a workout again. You’ve been working out consistently, eating clean, seeing great results...and then it happens. You hit a plateau. Even though you haven’t changed any of your healthy habits, you stop seeing results—and start feeling stuck, frustrated, and discouraged. If you want to get back on track with your fitness and weight loss goals, a personal trainer can help you identify what caused the plateau and create a customized workout and diet plan that matches your goals. Problem solved! You may be at a point in your fitness journey where you’re recovering from an injury, dealing with health complications, or restarting an exercise routine after pregnancy or some other doctor-enforced break. In any of these situations, it can be difficult to find a safe exercise routine that also promotes weight loss, muscle gain, improved endurance, or any other goals you might have. A personal trainer can help you find the perfect workout for your needs and abilities, and they also will be there to provide insight, support, and encouragement as you face this uphill climb towards your goals. Okay, it’s time for honesty hour. How often do you quit your workout before completing that final set of reps? How often do you slow your pace when it starts to get hard? How often do you bail out on the last interval round? It’s important to listen to your body—we don’t want you to risk injury or overexertion in any way! But...it’s also important to push yourself, challenge yourself, and stretch yourself in order to achieve results. You’re not going to lose those next five pounds or see those biceps pop if you’re still lifting the same weight you were two years ago. So, if you’re struggling to motivate yourself to give every workout 100% of your effort, it might be time to exercise with a personal trainer. They’ll keep you safe while also challenging you to take your fitness to the next level. Here’s the bottom line: we want you to succeed. So, if you’re ready to show up and start taking steps towards your biggest goals, we want to be there for you. Click here to schedule a free, zero-pressure consultation with a personal trainer...and get ready to start seeing results.